Learn to eat like they do on “The Gilmore Girls” during The Gilmore Girls Fan Fest in Washington Depot, Conn.
Those lucky enough to get tickets will meet cast members from the hit TV series “Gilmore Girls,” and take part in a weekend of festivities in Washington Depot, Conn., the rural setting that sparked inspiration for the show’s fictitious town, Stars Hollow. 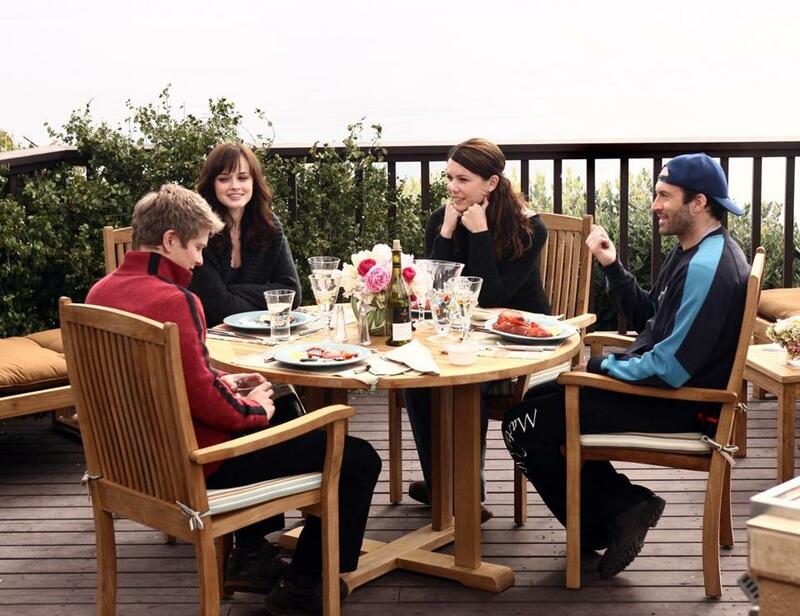 The Gilmore Girls Fan Fest, produced by fans Jennie and Marcus Whitaker, takes place Oct. 21-23 and includes events drawn from the show, such as a tea at the inn, coffee at the hardware store, a staged knit-a-thon, and a Friday night dinner. Kristi Carlson, who wrote the “Eat Like a Gilmore” cookbook (due out in late October), will host an event that includes a recipe from Luke’s Diner, Sookie’s inn, or one of the Gilmore’s Friday night dinners. Numerous cast members are expected to attend a panel at Town Hall, Oct. 22, including Biff Yeager (Tom), Kelly Bishop (Emily), Rini Bell (Lulu), Ted Rooney (Morey), and Vanessa Marano (April). www.gilmoregirlsfanfest.com. Sample lobster claws, fried calamari, and other delicacies from more than 50 local restaurants at the Hampton Beach Seafood Festival, Sept. 9-11. The event, which serves as the unofficial end to summer in this swinging seaside community, also includes local products from more than 80 arts and crafts vendors, and some screaming deals from merchants along Ocean Boulevard. Stop by to watch chefs’ demonstrations, take part in a lobster roll-eating contest, and see 15 bands and orchestras perform on two stages, including the Journey tribute band The Great Escape. Don’t miss the fireworks Saturday night and skydiving demo on Sunday. Admission: $5-$10, depending on day; children 12 and under free. Free parking and shuttles at 13 sites around town. www.hamptonbeachseafoodfestival.com. Stay at the Four Seasons Hotel Las Vegas and enjoy a luxury helicopter tour that takes you to private landing spots in the Grand Canyon and Valley of Fire. Vegas-based Maverick Helicopters has teamed up with the AAA Five Diamond hotel to offer guests the three-hour Natural Wonders Experience. Your private chopper will whisk you from Maverick’s Vegas terminal to the highest peak in the Valley of Fire, considered one of the southwest’s most remote destinations, where you’ll have clear views of the surrounding red sandstone formations. Then fly 3,500 feet below the Grand Canyon’s West Rim to a private landing site on Hualapai Indian Territory. From this spot, just 300 feet above the Colorado River, enjoy a champagne lunch prepared by the Four Seasons’ culinary team. Back onboard, you’ll swoop over Lake Mead, Fortification Hill, and Hoover Dam before buzzing over The Strip and Downtown Las Vegas. Starting rate: $7,495, includes two-night stay and airport transfer. 702-632-5300, www.fourseasons.com/lasvegas. Watch herders move 1,500 sheep through Ketchum, Idaho, in an annual tradition that dates back more than 150 years. The Trailing of the Sheep Festival, Oct. 5-9, includes five days of festivities that highlight the history, heritage, and cultures of Wood River Valley in central Idaho. The award-winning event features championship sheepdog trials, music, storytelling, folk and traditional arts, lamb cuisine, and a Wool Festival with classes, workshops, and a quilt show. It culminates in an authentic migration, following the tradition of moving sheep (called trailing) from high mountain summer pastures through the valley to winter grazing areas. Most events free. 208-720-0585, www.trailingofthesheep.org. What does your furry friend get up to when you’re away? Find out with the Petcube Camera, an interactive wireless pet monitor that also lets you communicate with your dog or cat while you’re on the go. The stylish cube comes with a 138-degree field of view, and can stream high-definition video to your Apple or Android device. Download the Petcube app, and then set up the camera and connect it to your home Wi-fi network. Use the camera to check on your pets — you can even hear what they’re up to and talk to them using the two-way audio connection — and take a photo or video from your smartphone. The best feature: The built-in controllable laser beam, which lets you interact with your pet while traveling. Just move your finger around your smartphone screen to direct the laser beam around your room at home. $149. www.petcube.com. Pack Camp Chef’s Outdoor Entertainment Gear Big Screen 92 for your next camping adventure, family reunion, or business trip, and you can show movies and slideshows on a high-quality viewing surface. The screen is made with a durable oxford nylon material, and lightweight (4 pounds) yet sturdy aluminum poles. Purchase a handy leg and tie-down kit so you can stand the screen up on a grassy or sandy surface and stake it down securely. Otherwise, easily tie the screen with its aluminum frame to tree branches, or attach it to a fence or other sturdy structure. It’s light and easy enough for one person to set up and maneuver. The screen comes with a 16:9 wide-angle viewing ratio, and offers a crisp and super clear view. $159.99 screen; $69.99 Big Screen Leg Kit. 800-650-2433, www.campchef.com.